Why don’t you try to harvest local fresh crops by your hand? You can taste them there and take them away, or add it to Processing Experience program. There are many ways to enjoy. The current all programs are for seasonal only. 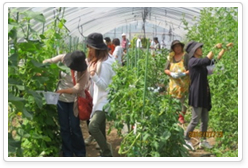 Please try to experience “Fresh taste” and “Joy of harvesting” at these programs. We also recommend enjoying to take public bath and have a Jingisukan BBQ outside after harvesting. Haskap has plenty of vitamin C and anthocyanins, and is effective in health and beauty. 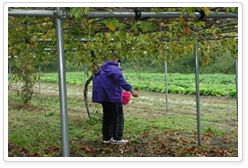 Atsuma has the most cultivated area of Haskap in Japan. 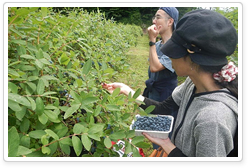 You can enjoy Haskap Picking on 9 farms in Atsuma. 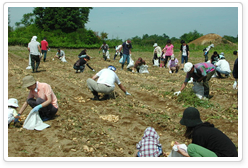 You will be able to harvest “May Queen” potatoes, our local specialty where grew up in fertile land in Atsuma. It is also popular to set the lunch of Azuma Jingisukan. Kokuwa is a kind of kiwi fruit and its taste is similar too. You can enjoy eating as it is, and so as good for jam and fruit wine. There are two farms you can enjoy this activity. Safe and secure fresh vegetables can be harvested. Please enjoy harvesting various vegetables, such as cabbages, tomatoes, cucumbers, broccoli, eggplant, peppers, etc.